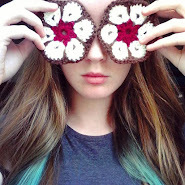 This is the first time I've ever tried crochet, and this is what I made! This is my wool/knitting stash. I got the three balls of green wool from a 99p shop and they are really bad quality. The strands always come apart and it's annoyingly hairy, but I didn't know the difference at the time. I got them to make a Christmas scarf for an ex, but I got so bored and fed up with knitting that I gave up and bought a home-made looking scarf and pretended I'd made it instead. (He was impressed and wanted me to make more things, awkward...) After that I bought some nice chunky red wool to make a scarf for myself, but I quickly got bored again. I just found it so mindless, but you do have to concentrate on what you're doing so it's not like you can watch TV at the same time. 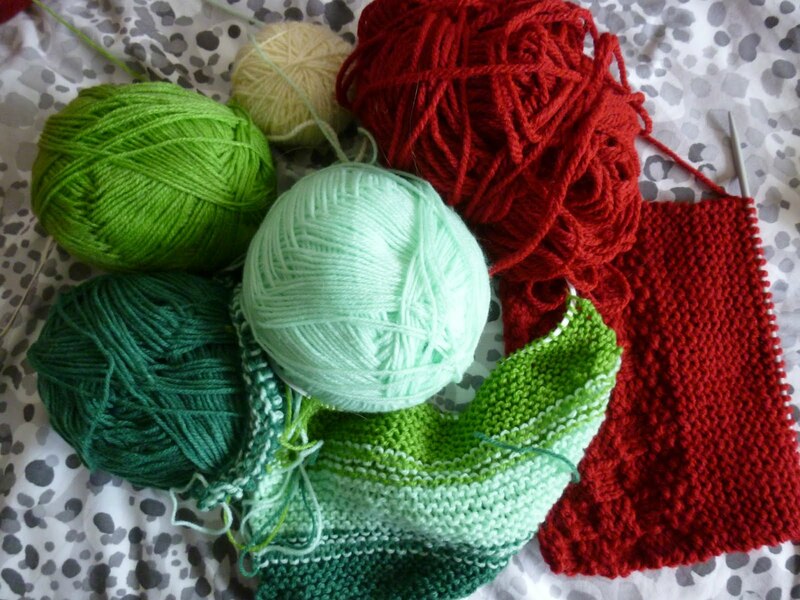 Anyway, that ended my fling with knitting. I've also lost the other needle now. 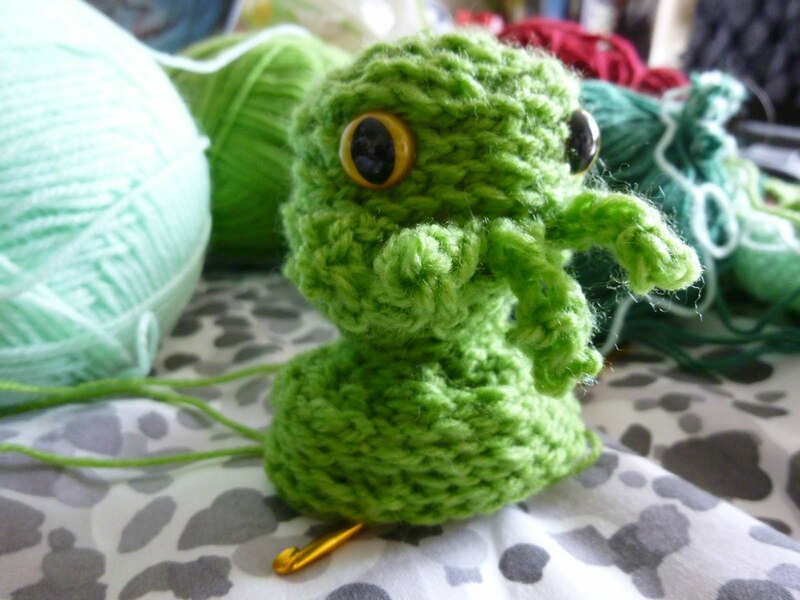 Whilst browsing the internet one day for a good compendium of H P Lovecraft's work, I came across this free Tiny Cthulhu Pattern, and it's so adorable I couldn't resist. So I bought some crochet hooks and safety eyes, dug out my wool from deep under the bed, and watched one YouTube tutorial before starting. I have very much a 'learn as you go' mentality. So it turns out that if you don't leave quite a lot of slack in the loops that they get really really tight and impossible to get the hook into. I was trying too hard to make it neat and tidy, so I started again with a different colour and made the whole thing much looser. Things have gone a lot better and lumpy cthulhu is quite endearing at this point. I was planning to start again since I realised that I read the tentacle instructions completely wrong; they're supposed to be longer and coily-er. But then I put eyes on him and he begged to be completed, lumps and stumpy tentacles and all. The lumpiness can be intentional, he is a scaly draconic octopus monster. The body is finished and I've discovered something- I've done the whole thing in slip stitch instead of single crochet. Ah well, I still love him. All that's left is some little arms. As you can see, I decided to skip the wings and add some extra tentacles. Some of them are getting close to how they're supposed to be, but I like the messy look so I decided to keep them as is. 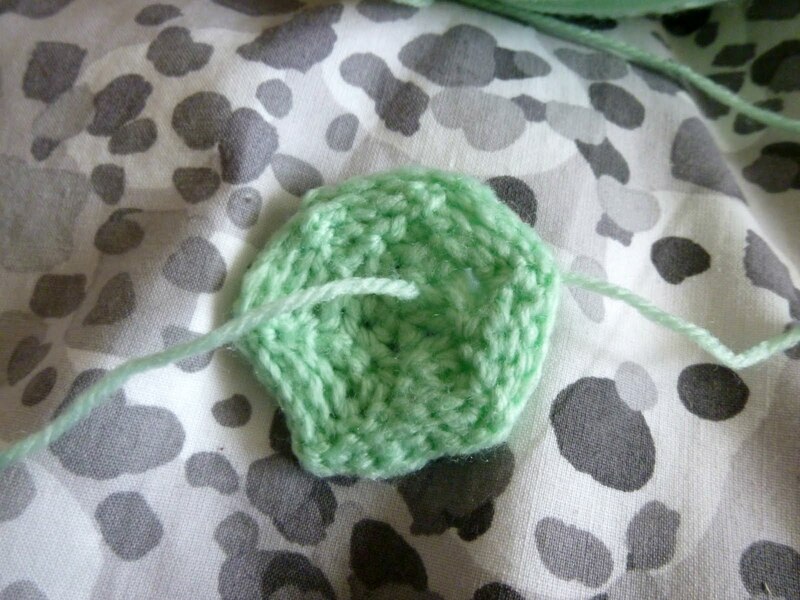 Crochet is seriously not hard (even though I did everything wrong) and I get this little guy at the end of it. He's just a baby, the runt of the litter, so expect to see some more fearsome Cthulhus in the not-so-distant future. I'm tempted to make an army. D'aww. A face only a mother could love. I'm liking this new hobby. All my friends and family will probably be receiving little green monsters for their birthdays.